The other day I went looking for an owl to photograph. I have a fondness for owls. Not only do I think they are beautiful, but, they are fun to watch. You can almost see their feelings on their faces. I had been standing there for just a short time (maybe 30 seconds my second time around) and a woman asked me to move along. Or basically, “Don’t stay too long!” I was taken aback a bit. Honestly, I thought her shouting that at me to get my attention was worse than me standing to take a few photos. I explained I knew what I was doing and she shrugged and moved along. I did photograph the owl twice. Both times, I kept it very short. The telephoto lens meant I didn’t need to get super close and I could take a bunch at different settings. I then left, walked away for a while, and then returned for a different angle. I had no plans to stress out the owl. I don’t even share where the owl is and I respect it. It is their habitat – not ours. As I left, I walked down the trail and eventually met up with the woman again. She took time to apologize for how she came across and I explained that I felt like us talking was more disturbing than me standing quietly and shooting. What she explained next was so annoying. A photographer had come a year ago, at dusk, and set up his tripod and flash and proceeded to photograph the little owl. The flash is a big no-no. And setting up just to use the flash? That’s just wrong. The owl flew away and didn’t return for a long time. As nature photographers, it is imperative that we respect nature. That means that we may not get a perfect shot. We may miss an opportunity or can’t get as close as we’d like. What matters is that wildlife and nature go as undisturbed as possible. I remember one time I was driving and saw a Great Horned Owl. It was on a branch that I could see from the road. Clearly. I turned my car around and drove back. I suppose I could have parked my car somewhere, gotten out and walked to a spot to get a closer shot. But I simply rolled down my window, looked for cars, and shot as much as I could. The photos aren’t great. I didn’t have a big telephoto with me. I was in a hurry and hadn’t changed my depth of focus. But I had a wonderful experience with the owl. The same goes for any wildlife. Bears in Shenandoah. Turtles in ponds. Anything out west. It is one reason so many photographers are no longer sharing locations. I won’t tell anyone where this owl is unless I know, 100%, they are a photographer that respects nature. It took me 2-3 times of going to the location just to find the owl. I knew the general area and that was enough. We go. We search. We respect. I wish everyone operated this way. I grew up in a very small town in Michigan. I didn’t think much of it while growing up until I moved out here to the DMV area (Washington DC, Virginia, Maryland). It was then that I realized how tiny my area is and how rural it is. I do enjoy going back to visit but I could never live there again. My parents are still there so I do end up in Michigan 2-3 times a year. I wish it was more but alas, life. The kids and I were there for Christmas this past week. I did not have very much time for photography and didn’t have any time to get out and hike. There are a couple of small trails I try to go to while there but just didn’t have a chance. My father is not quite home bound but he can’t walk for very long and uses a walker. It does make me sad because the love of the outdoors was instilled in me by my father. He used to always go for walks – long ones. There are train tracks near the house and he’d walk down those any chance he got. The photos I took this past week are rural photos. They showcase the county where I grew up and the history. First, THE Polar Express. 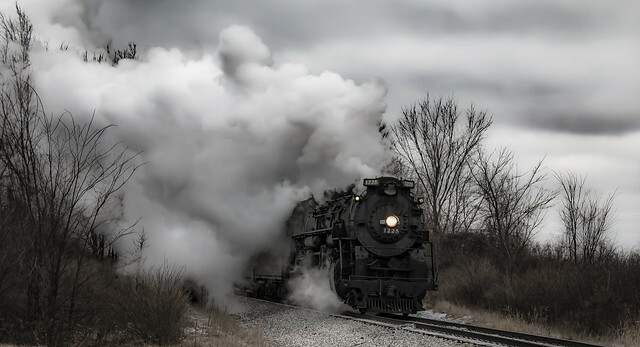 The Pierre Marquette 1225 Steam Engine was the model for the movie The Polar Express. Each year, you can buy tickets to ride it from my hometown up to another small town where they have a Christmas village. They try to make your experience like the movie so they have bells and hot chocolate. It runs right past my parents’ house so I always try to get a photo of it. I am incredibly happy with my photos this year and am featuring one below. I just ordered a large metal print of this and am excited to receive it. As I was out driving around, I came across what I thought was an old chapel or church. 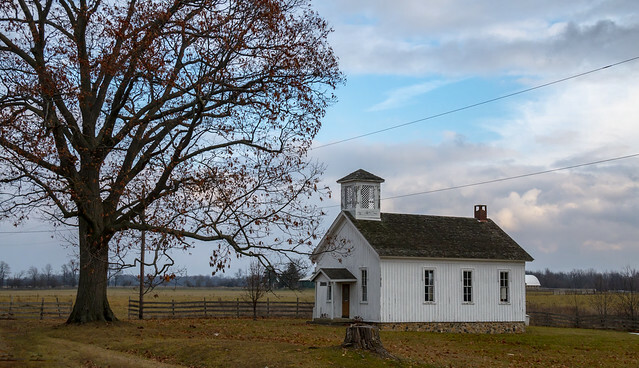 I did some research and found out it is actually one of the first schoolhouses in my county. It was built around 1849 for $166. I love that fact. $166… the money was from the taxes. I found out it is privately owned. If I would have had more time, I might have called the people and asked to photograph the inside. In all my years growing up, I had never seen this. I really enjoy photographing barns. In the right setting, they can be beautiful. And one thing is for certain, there are numerous beautiful barns in Michigan. 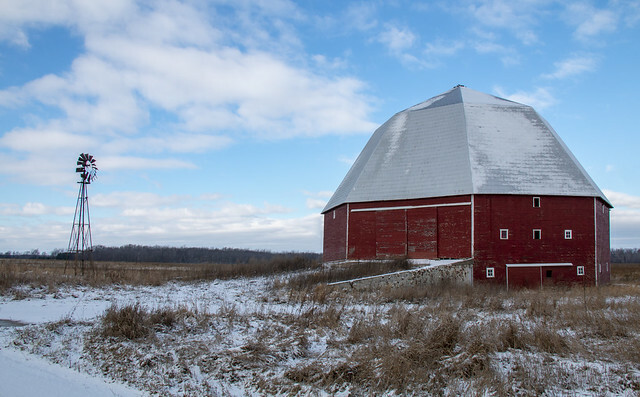 I had read about an octagon barn in the area and really wanted to see it. Like a dork, I had driven the wrong direction and missed it. My sister stopped in to see me and said, “Hey! I know of a barn you might want to take pictures of.” and told me about the same barn. She told me exactly where to find it and I took off. I have to say it is a wonderful barn. 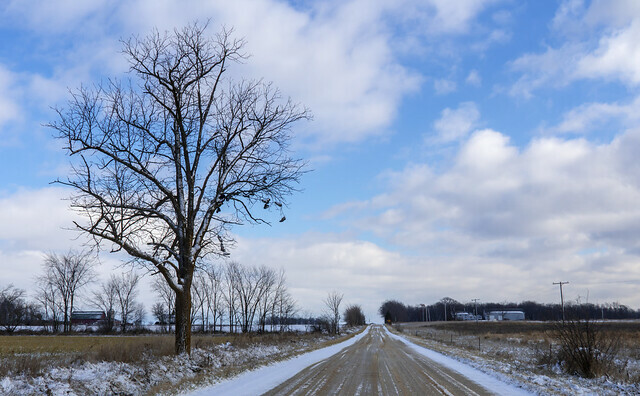 The country roads near me are often empty so I was able to park and take as many pictures as I wanted. I took many barn photos on my trip but this one is my favorite. Overall, I’m pretty pleased with the photos I took. I really wanted to get to a Wildlife Management area while there but, as mentioned, I ran out of time. Note to self: Save up more vacation hours. I feel like I was truly able to capture the feel of my county. Wide open fields. Barns. Bare trees in winter. I’m going to share one last photo below. I saw this tree with shoes hanging from it. It felt very random because there is nothing near this tree. Maybe a farmer in the area started it? No idea but it was humorous. All rights reserved. Any usage or reproduction of these images is against the law and violators will be persecuted. Do NOT save my photos. Thank you. This past summer was great for my photography. I was lucky to see numerous butterflies, dragonflies, and flowers. I hiked a lot less than I normally do. The free weekends I had were spent running Spartan Races versus hiking and that’s okay. I’m hoping that my Saturdays will free up soon so I can get back to it. I imagine I’ll be hiking a ton this winter to make up for it. I wanted to share a handful of photos from this past summer. Some of these are included in my calendars that can be pre-ordered but I am also leaving some as a surprise. I’m pleased to share that my 2019 calendars are available for pre-order. Last year I made a calendar almost on a whim and people went crazy for them. This year, I had a request for an all-flower calendar. To be honest, it was hard to pick photos for that because I have so many flower photos. I also wanted to do a landscape/nature calendar so I have two for people to choose from. The options are on my website and all orders will be sent or delivered in December. For those who live near me, I’ll be hand-delivering them. Otherwise, all will be sent priority mail. These are full 8×10 calendars with sturdy pages. Each page is like receiving an 8×10 color print of my photo. I have gotten samples from other, less-expensive places but I couldn’t do it. I had to go back to my original vendor because quality is important. Go to https://jennifergonzalez.com/calendar-pre-orders/ to place a pre-order. Obviously, I recommend ordering one for the office and one for home. Or one for you and one for a friend. Place your order soon to receive in December! First Day Hike – Welcome 2019!